Domestic and Industrial refrigerator give you different indicators or signs when it is low on Gas (refrigerant). 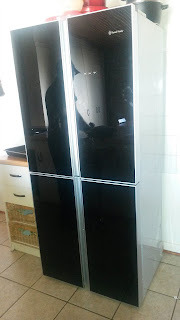 In this post I am just going to cover domestic fridges/freezers and in another post I will do industrial fridges (walk in refrigerators). 4. At stage four your fridge is not making any ice anymore but the inside back is still sweating a lot with water dripping continuously. The moldy smell has also increased. The freezer section is now really over-icing. At this stage you also start breaking the inside-draws because they are now freezing soled and are stuck. Clicking sounds start to increase. In another post I will explain more about that clicking sound. For now if you don’t speak Refri-lingo the "clicking" sound means "Help!" 5. At stage five your refrigerator is close to dying a horrible death, it becomes noisy and stays off for long period. The frozen food becomes soft and everything starts to defrost. If you notice any of the above mentioned signs in your refrigerator don’t let the compressor and refrigerator suffer. Switch it off straight away then get a professional to come analyze your refrigerator.